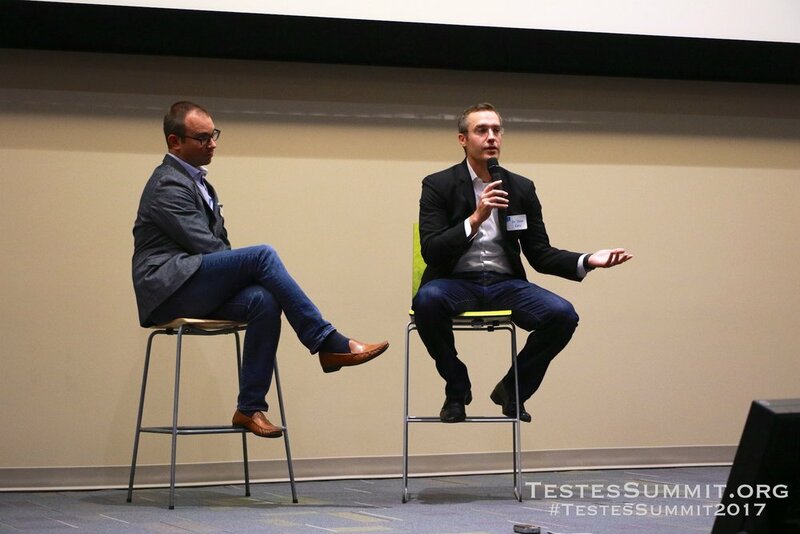 The Testicular Cancer Summit of 2017 was a one-time grassroots collaboration between individual testicular cancer survivors leading and developing the very first open to the public conference anywhere in the world specifically for the testicular cancer community, with support from the Testicular Cancer Awareness Foundation serving as the event's primary sponsor and fiduciary. The founders and primary architects of the "Testes Summit" were 40+ year testicular cancer survivor and author, Ron Bye, and 6 year survivor and award-winning cancer blogger, Steve Pake, with significant contributions and intellectual might from 10+ year survivor, Mike Craycraft, founder of the Testicular Cancer Society, and owner of the TC-Cancer.com web forum. 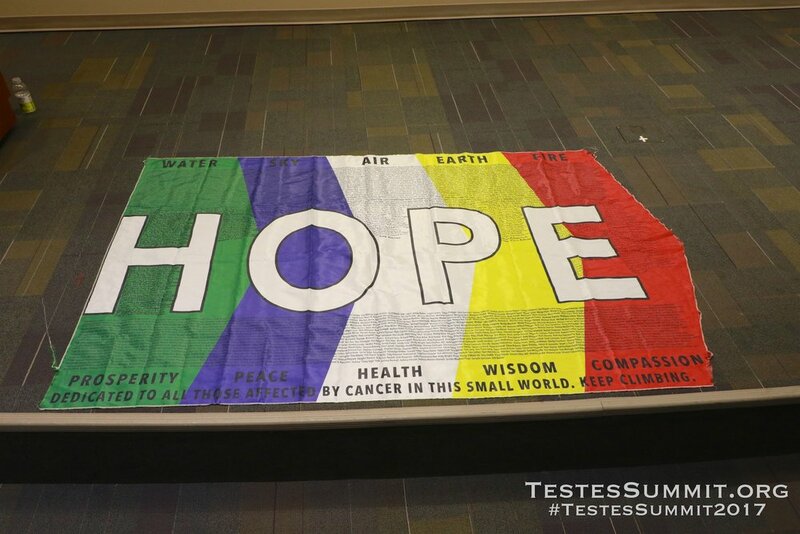 The Testes Summit was held in Aurora, CO from October 13-15, 2017, and was attended by testicular cancer survivors and non-profit missions from all over the world, including from as far away as the U.K. and South Africa. Highlighting the Summit were keynote speakers, Dr. Lawrence Einhorn of Indiana University, Dr. Ajay K. Nangia from the University of Kansas, Dr. Phil Pierorazio of Johns Hopkins Brady Urology, and Dr. Clint Cary from Indiana University. The event concluded with a special presentation by two-time cancer survivor and motivational speaker, Sean Swarner. It was a fantastic and truly unforgettable weekend for all attendees! 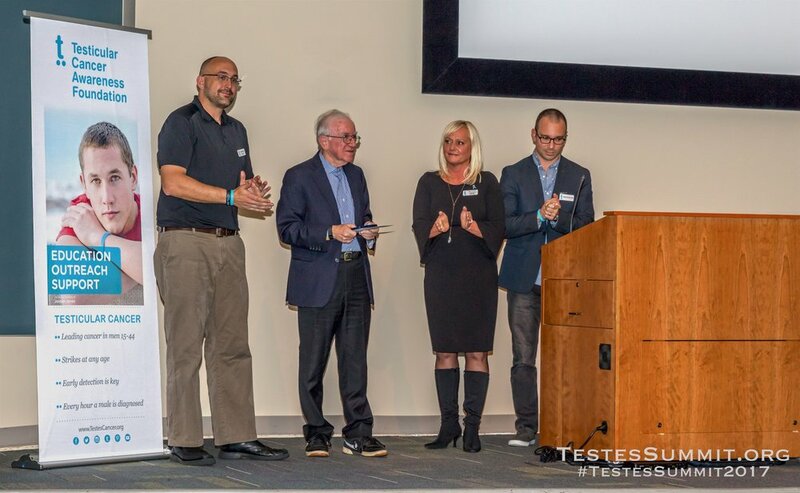 TestesSummit Owner/Co-Founder and Chair, Steve Pake, with Dr Lawrence Einhorn, Kim Jones, CEO of TCAF and primary sponsor and fiduciary for the event, and Dr. Phil Pierorazio, at the 2017 Testicular Cancer Summit. A group photo with the one and only Dr. Lawrence Einhorn after his amazing Keynote presentation and Q&A session. 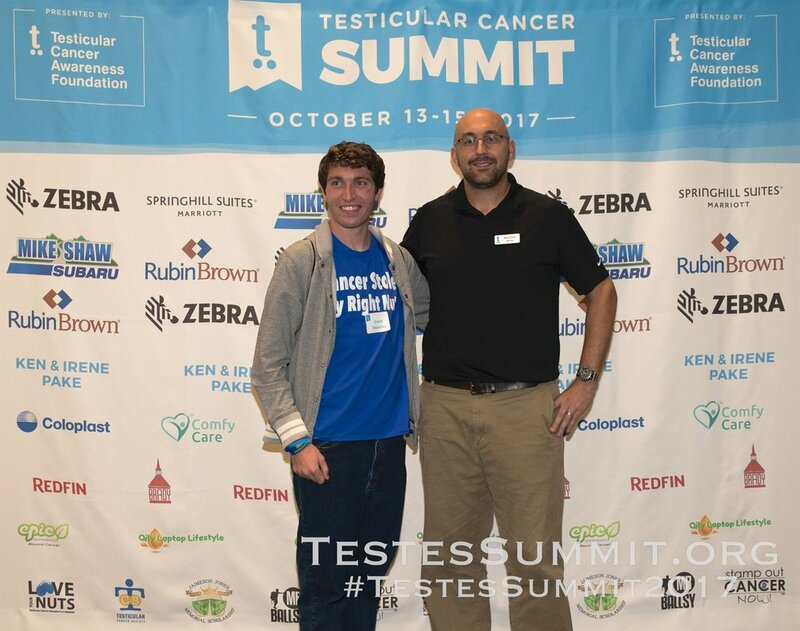 The founders of the 2017 Testicular Cancer Summit have no affiliation or involvement whatsoever with the various organizations now hosting their own organization specific Testicular Cancer Conferences and Summits, for their own purposes. While this isn't exactly the direction we'd hoped things would go in for our broader TC community with splintered org specific gatherings when we're all already so scattered and isolated, it is what it is, and thus we consider the 2017 Summit to be a one-time and one-off event at this point. Thanks again for being a part of it. 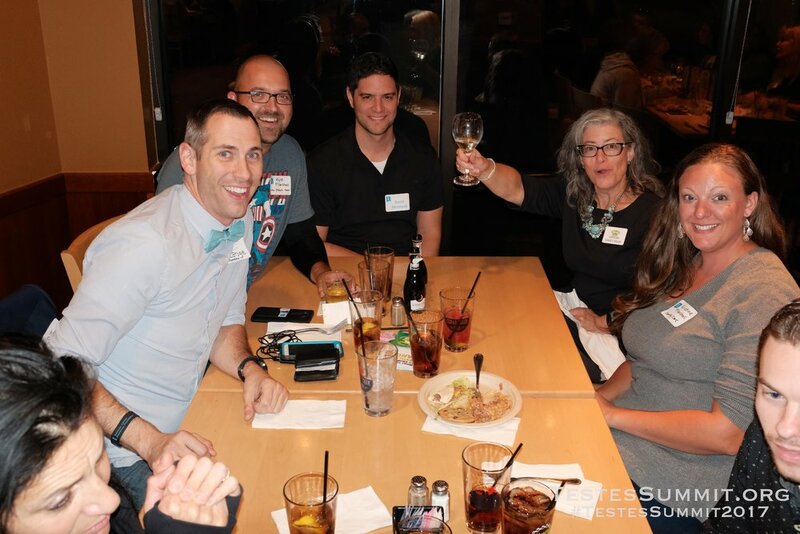 Any attempts by other organizations to connect or affiliate themselves with the original 2017 Testicular Cancer Summit are not authorized, and the only authorized place to read anything about the original TC Summit is right here. Read More About the Testicular Cancer Summit of 2017 Below! It’s coming this Fall 2017! Mark your calendars for October 13-15th in Denver, Colorado for a first of its kind Testicular Cancer Summit, featuring Dr. Lawrence Einhorn as an honorary guest speaker!If you’ve been wondering what’s going on and what this is all about, here are the Top 5 things you need to know about the Testicular Cancer Summit. Bringing Survivors and Experts Together for a Weekend of Awareness, Education and Support. Mark your calendars. October 13, 14 & 15, 2017 at the University of Colorado Anschutz Medical Center will host the first Testicular Cancer Summit. During this weekend long event we will discuss life with cancer and the many lifestyle changes that can help the healing process. Motivational speakers, keynotes on lifestyle, and support systems will all be part of this summit. We hope to see you there. Dr. Einhorn, or "Dr E" as he's affectionately referred to within the TC community, is a man who needs no introduction. Many of us would not even be here were it not for Dr. Einhorn's pioneering work in the 1970's that led to a once in a generation leap in the oncology field, and the cures for many cancers including Testicular Cancer. At the Testicular Cancer Summit, we will have not one but two amazing testicular cancer doctors on hand to answer your questions in two hour-long "Ask the Oncologists Anything Q&A" breakout sessions, Dr Phil Pierorazio of Johns Hopkins Medicine, and Dr Clint Cary of Indiana University! You've already been introduced to Dr Pierorazio, but here's a bit about Dr Clint Cary! Testicular Cancer Summit Keynote Speaker - Dr Phillip M. Pierorazio, M.D. I am an urologist at Johns Hopkins in Baltimore, Maryland and a passionate advocate for our testicular cancer patients. I am a member of the National Comprehensive Cancer Network Guidelines Committee for Testicular Cancer and considered among the experts in robotic and open retroperitoneal lymph node dissection. There is no cancer like testicular cancer, it affects young men and because of the high cure rate, can have lasting effects for decades after successful treatment. For those reasons and more, there is no patient population like testicular cancer survivors – and there is no more rewarding group for whom to care. The Testicular Cancer Summit also pleased to welcome Dr Ajay K. Nangia, MBBS. Dr Nangia is a Professor of Urology at the University of Kansas Medical Center, and has expertise in the areas of male infertility and testosterone deficiency, of direct relevance to many testicular cancer survivors! The Testicular Cancer Summit is pleased to have Emily Cox-Martin, PhD as a panelist! "I am a Clinical Psychologist and Assistant Professor in the Division of Medical Oncology at the University of Colorado School of Medicine. Working in the field of Psycho-Oncology, I help patients improve coping and adjustment around their diagnosis. I focus on the difficulties that emerge at the intersection of cancer and mental health across the cancer continuum, from diagnosis into survivorship. I am excited to have the opportunity to be a guest speaker at the Testicular Cancer Summit but more importantly, for the opportunity to meet so many other survivors and caregivers face to face and learn of your experiences. Whether we are a survivor, caregiver or healthcare professional we have each traveled a unique path to where we are today. I look forward to being able to share ways that we can continue to move forward and get back to living life. After our experiences, life may never be the same as it was before we were affected, but I hope that we can all find ways to embrace the “new normal.” I look forward to seeing you all in Denver. Fantesticle news - Guest speaker at the Testicular Cancer Summit! Being a cancer survivor we all of have story to tell. I like to focus on something “different”. I’m looking forward to share the challenges of a testicular cancer mission in South Africa where besides cancer and its horrible side-effects people have to deal with: no or limited access to clinics and doctors, language barriers, witchcraft, cultural taboos, stigma, rejection, lack of funds, lack of medication and lack of knowledge to name but a few. The Jaimeson Jones Memorial Scholarship has two missions: Providing scholarships to families who have experienced childhood cancer, and preaching early detection of TC by teaching its signs and symptoms. JJMS is dedicated to changing the culture of silence about men’s health and heightening people’s awareness about testicular cancer, and to do that, we get them where they live: with humor. We are beyond honored and thrilled to be attending the first-ever Testicular Cancer Summit. Jason is looking forward to the Testicular Cancer Summit because it is a great way for all members of the Testicular Cancer community to come together and interact. He will be able to share his story with others, but also learn from other Testicular Cancer survivors as well! There will be survivors from all over the world and many Testicular Cancer foundations, as well as world renowned doctors who specialize in the treatment of Testicular Cancer. With all these elements and this being the first event of its kind anywhere in the world, the event is sure to be a major success! Jason will be speaking about his cancer journey as a student in high school and the impact it had on his life. He will also be discussing what young men can do to be more active about Testicular Cancer awareness in their own communities. After being diagnosed with stage 3 Testicular Cancer that spread to my lymph nodes (because I put off going to the doctor), I got inspired. Two years ago, I created a campaign that received worldwide attention - I pushed a giant inflatable testicle across 2 countries and over 8,000 miles to raise awareness for this cancer. Yes, you heard that right, a giant NUT! The Testicular Cancer Summit of 2017 was a one-time grassroots collaboration between individual testicular cancer survivors leading and developing the very first open to the public conference anywhere in the world specifically for the testicular cancer community, with support from the Testicular Cancer Awareness Foundation serving as the event's primary sponsor and fiduciary. The founders of the "Testes Summit" were 40+ year testicular cancer survivor and author, Ron Bye, and 6 year survivor and award-winning cancer blogger, Steve Pake, with significant contributions and intellectual might from 10+ year survivor, Mike Craycraft, founder of the Testicular Cancer Society, and owner of the TC-Cancer.com web forum. Dr Lawrence Einhorn from Indiana University is the doctor who invented the cure for Testicular Cancer over 40 years ago, and whose work was directly responsible for saving hundreds of thousands of lives across the world, and represented a once in a generation advancement in the field of oncology. The Cisplatin drug he developed is responsible for not just curing testicular cancer, but is a part of the cure for many other cancers as well. 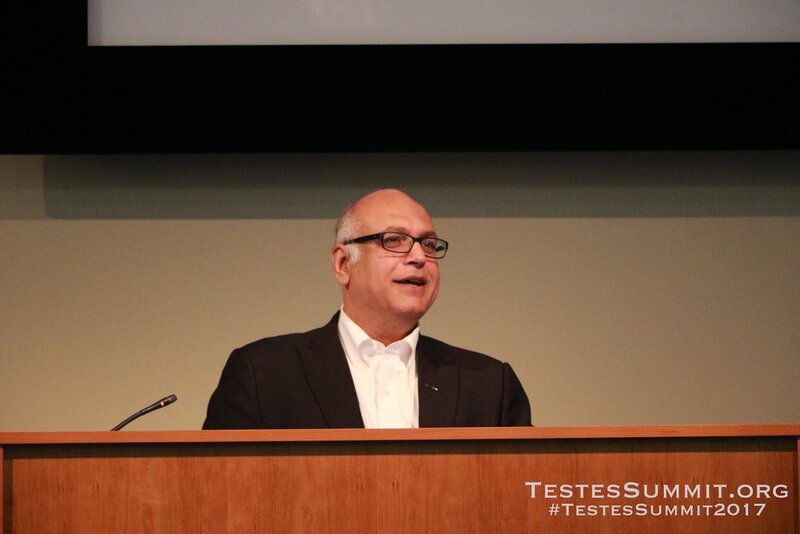 It was a great honor to host Dr Einhorn at the first ever Testicular Cancer Summit. Special thanks to Testicular Cancer Summit Co-Founder and 40 year survivor Ron Bye, for reaching out to Dr Einhorn to attend. Dr Ajay K Nangia from the University of Kansas was an unknown to the Testicular Cancer community before the Summit, but instantly became a “rockstar” for his enthusiasm and passion for patient care in his area of speciality, infertility. Special thanks to Mike Craycraft of the Testicular Cancer Society for bringing him into our world. A lot of people wonder “who’s next” after Dr Einhorn. Dr. Phil Pierorazio from Johns Hopkins University represents the next generation of testicular cancer experts. “Dr. P” is a urological-oncologist who handles both the medical oncology of testicular cancer, and surgeries such as the RPLND as well. We are truly in good hands with Dr. Pieorazio and his peers, such as Dr. Clint Cary from Indiana University, and they will continue to be a great resource to the testicular cancer community going forward.